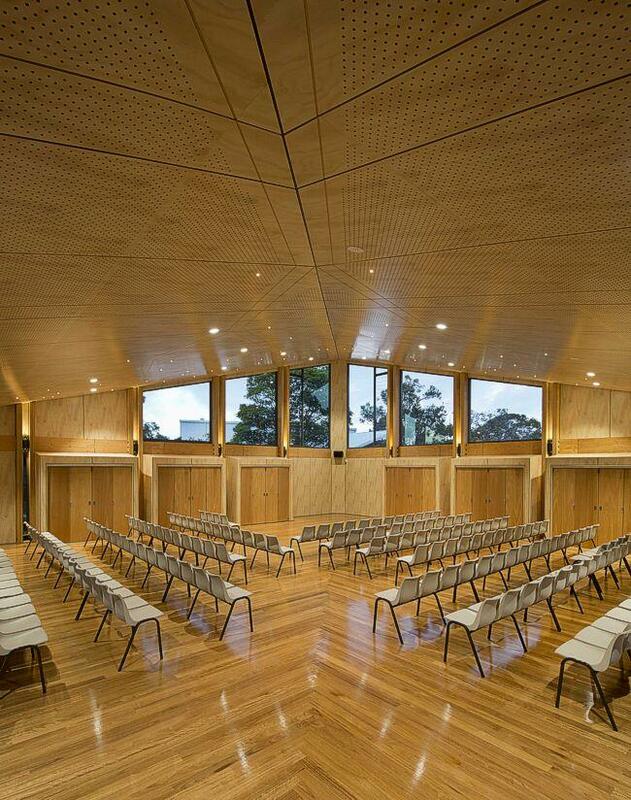 SUPAWOOD’s SUPACOUSTIC acoustic panels warm the interior of the new award winning multipurpose hall at St Pius X High School in Adamstown, Newcastle NSW. In mid-2012 the school’s hall was completely destroyed through fire by suspected arson, the damage estimated at more than $500,000. Schreiber Hamilton Architecture were given the brief to design a new communal meeting place using simple materials which would serve as a long lasting centre of inspiration and reflection for the school. SUPACOUSTIC customised panels in SUPAFINISH Hoop Pine concept veneer perfectly fulfilled the interior design intent. Offering a highly durable consistent finish, a customisable acoustic option, proprietary fixing system and Group 1 fire rating, this product provided an effective cost saving alternative to plywood. 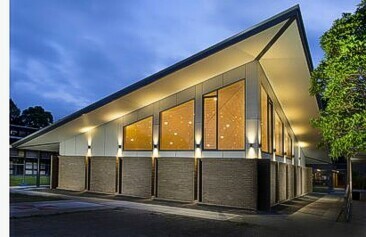 The interior of this building has incredible warmth evoked by the timber finish throughout. The ceiling has been lined with grooved and perforated SUPACOUSTIC acoustic panels which form a tree motif over the entire surface. Lighting has been integrated into the patterned panels to emulate twinkling stars. Matching SUPAFINISH Hoop Pine concept veneer panels have been used on the walls between windows and other matched joinery. The ceiling panels were supplied over size and prefinished with the pattern segments, then trimmed to size onsite so that they could be fitted exactly together to form the planned motif on the shape of the ceiling. As plywood was originally specified by the designers, SUPAWOOD assisted in redrawing the ceiling design to suit and provided full shop drawings to take care of the installation complexities. 2015 - Master Builders Association - Best Use of Timber - Winner. 2015 - Australian Institute of Architects - Newcastle Architecture Awards - Award for Excellence - Winner. 2015 - Australian Institute of Architects - Newcastle Architecture Awards - Educational Architecture - Winner.